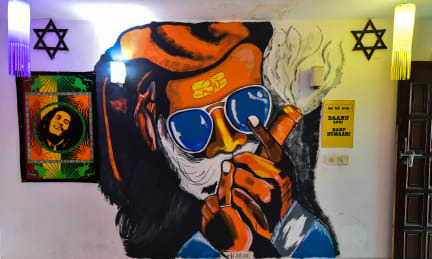 Bunkin Hostel i New Delhi, Indien: Reservér nu! It’s not even more than 12 months; we at Bunkin have managed to turn all the heads around with a combination of our 24x7 friendly service and facilities. Bunkin is more than just a place to rest when you want to escape Delhi's enticing chaos; it’s a place for community, friendships and stories. We are offering you everything you need after a long day of exploring; we are planning to make you feel like you have explored a new place after keeping your bags down, chilling and reading books. 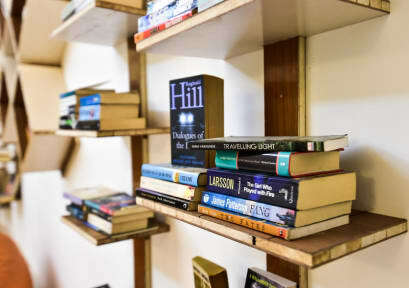 We have got fully furnished rooms with highly comfortable bunk beds; we have got a BOOK CAFÉ for all the thinkers, readers and book-lovers out there. We will be having crazy house parties on the roof top so that you can meet new people traveling out there, so after all this you won't feel like you are taking a break from your journey, you will feel like exploring. We are a great place to meet new people, the common area and the hangout area is the most popular space for everyone to hang out or just bring your cup of coffee and work through the day with high speed Wi-Fi and electronic music in the background. We also have a communal kitchen where you can cook our own food by yourself! Just remember to clean up after you finish your munchies. And, an open terrace courtyard for you to chill and party under the stars and the sun. We have accurately spacious dormitories and comfortable bunk beds, we have a 6-bed female dormitory because we care for your privacy and safety, we have got centrally controlled air conditioning in every dormitory, and lockers, super clean ultra-modern bathrooms, and of course high speed Wi-Fi! !Located right at Kalka Ji, South Delhi, New Delhi, the hostel serves you the best of both worlds. With two metro stations in proximity, you can just forget about the hassle of travelling in this mega-city. We will be taking you to tours every day, to some not-so-famous-yet-so-fabulous locations and hidden food hubs that are covered through social walking tours and we have several activities and events scheduled for you every day, so that you do not miss out on all the fun and madness around you! Activities include food walks and walk through the hidden gems of Delhi. You can leave it all on us to plan it from here. And don’t worry, we are here 24*7 to take care of you and keep you safe! We sure know how to make to make you feel at home while you’re away from home. So what are you waiting for? Just pack your bags and visit us soon! Bunkin is waiting, so come to Bunkin and let's get Bunkin'd!